SENSEI SHIRO ASANO 7TH Dan. Sensei Shiro Asano. Interview By Bozenna Tedder. Gyaku Zuki - To lean or not to lean? By J. P. Ward. Unsoku - (Moving The Feet). By S. Kato. A Tribute to Master Nakayama. By John Cheetham. A Shotokan Karate Safari. By Tom Mursalo. John Van Weenan. Part Two Interview. By John Cheetham. Sensei Kato at Seishinkai. Report By Paul Ives. A Weekend of Enlightenment. Report By Kirk Panter. 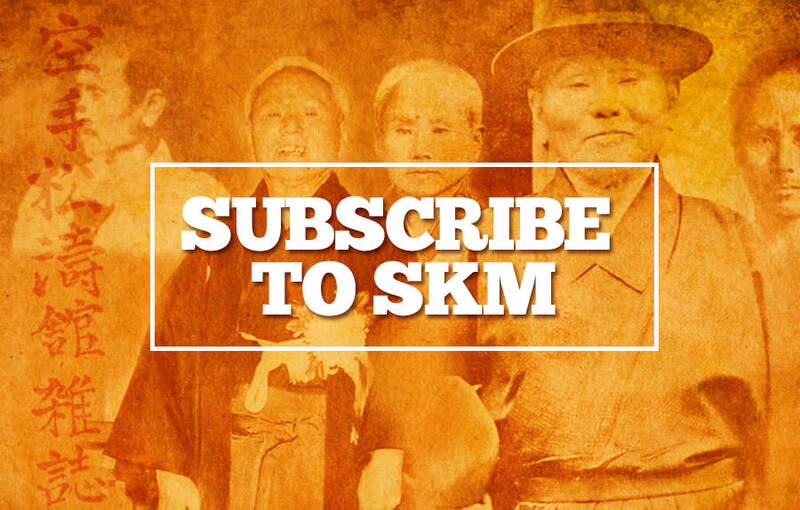 Welcome to issue no.12 of S.K.M. Judging by the dozens of letters received, everyone thoroughly enjoyed John Van Weenan's interview, so I'm sure you will all read Part Two with great interest. S.K.M. 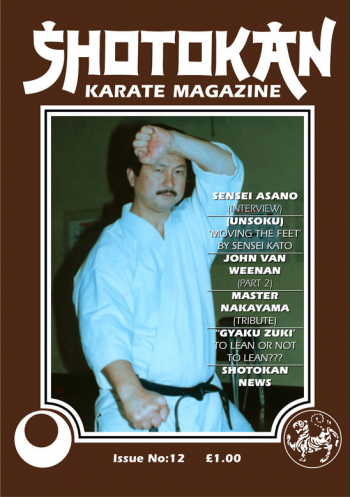 is very honoured to also have in this issue an exclusive interview with Sensei Shiro Asano 7th Dan the Chief Instructor to S.K.I. (GB) and Europe. You will find Sensei Asano's comments and views very 'Traditional' in the true 'Budo' spirit. This is a two part interview with part two in the next issue. A very controversial point, technically speaking, is raised in J.P. Ward's article -'Gyaku Zuki- To Lean Or Not To Lean?' This is definitely worth a read, most interesting and food for thought. In the, 'Tribute to Master Nakayama' there are quotes from the Late Master which you will not have read before regarding the expansion of the J.K.A.Worldwide. Also about the meaning of the J.K.A. emblem, the now infamous 'Rising Sun'. No apologies for featuring Sensei Kato in the magazine again. This time in a technical article dealing with 'Body Shifting' and moving the 'Feet' (UNSOKU). I personally could sit all day and watch him perform his Shotokan techniques. His ability is quite remarkable to say the least. As John Van Weenan points out in the Part Two Interview, we are so lucky in this country having such fantastic resident Japanese Senseis living and teaching in the U.K. They certainly don't come any better than Sensei's Enoeda, Asano, Kato and Kawasoe. Enoeda and Asano epitomise the 'Power' aspect of Shotokan, whilst Kato and Kawasoe are incredible technicians, with few equals. I purposely don't devote pages and pages to competitions which is a relief for many readers. Nobody seems to mind!